Allow me to get a little personal with you today. It’s been only a few months, but I feel like I know you already. It’s a good book, one that a lot of people worked really hard on. It was a first time for all involved, and I am proud of the work we all did. The stalls are all excellent, and you should definitely try them out. The problem: I left something out. Namely, this. I first went to Bamee Gua maybe 15 years ago. I was not yet Bangkok Glutton, and despaired in the lack of air conditioning, in the small portions, in the silent, elderly diners around us. Known by some as “Bamee Asawin” after their signature dish, Bamee Gua is the very best type of egg noodle shop: clean and efficient, with enough confidence in the kitchen to offer a wide variety of noodle- and rice-based dishes. 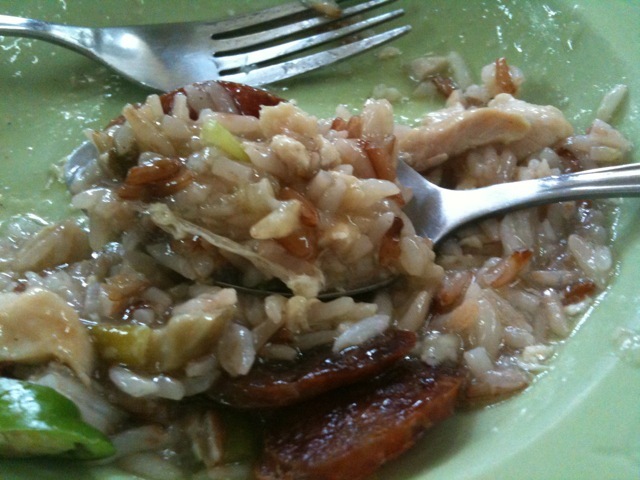 But I turned my nose up at the bamee asawin, delicately flavored with bits of thang chai (pickled turnip) (35-45 baht). 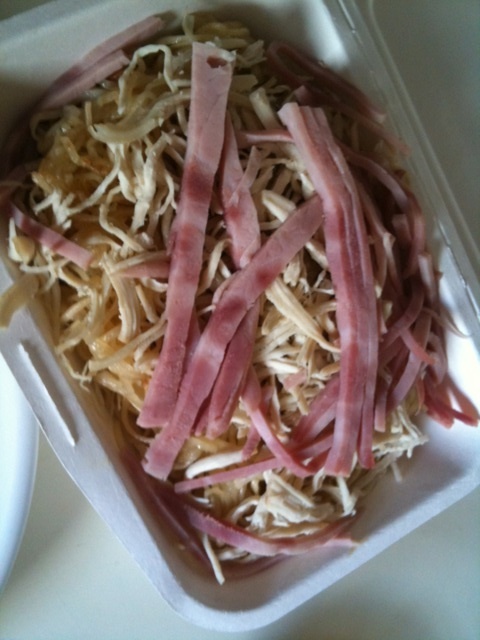 I ignored the buttery, silky e mee topped with strips of ham and chicken (100-160 baht, available only on Saturdays). I didn’t even see the delicious khao na gai (rice topped with chicken and gravy, 30-35 baht) or khao moo yang (grilled pork rice, 30 baht). I basically acted like my 9-year-old daughter now acts when we drag her to a street food stall. Like I was counting the minutes to Burger King. Since then, Bamee Gua’s e-mee has become a weekly habit, picked up every Saturday to reward myself after a punishing workout. I bow down to the excellence of their egg noodles (ranging from 35 baht for regular yentafo, or pink seafood noodles, to 55 baht for egg noodles with chicken, squid, pork, fish dumplings and fish meatballs). I acknowledge the buoyancy of their fish meatballs (40 baht with pork dumplings). Their minced pork-topped flat noodles, accompanied by a single raw egg yolk and accented with lots and lots of cumin (35 baht), are absolutely delicious. Are they in the book I just released? No. I know, I know. I know! I took them for granted. I plum forgot about them, writing about other places as I chomped down on their hammy ambrosia (to be fair to me — because we must always be fair to me — there is a whole bunch of awesome street food in this city, ESPECIALLY when it comes to egg noodles). I hope they don’t cut off all ties in retaliation, denying me the pleasure of my typical Saturday lunch. To make up for it, please allow me to say: Go here. Eat at this place. It tastes good. Pingback: Thai street food expert: favorite dishes & stalls in Bangkok – Thailand in a Box. Delivered to you within 24 hours. Hooray for B2S for being so smart in picking up this book! May all of the other stores in BKK follow suit soon! Bangkok needs this book–residents as well as visitors–I’m so glad it has been written and I hope there will be a sequel. Thanks Janet. I hope you enjoy the book! Just received the book. It’s so great! Well thought-out, easy to comprehend and use, super organized, beautiful visuals, and certainly more thorough than what’s out there for Thai food stalls (curious if you need to squat? Need pics of what the dish should look like? Can’t read Thai? It’s all in there!) I’m getting copies for friends who are planning to visit Thailand – a perfect gift! Thanks, chissa! You’re very kind. Kiaw Pla is a most unique food…. often ignored by many. 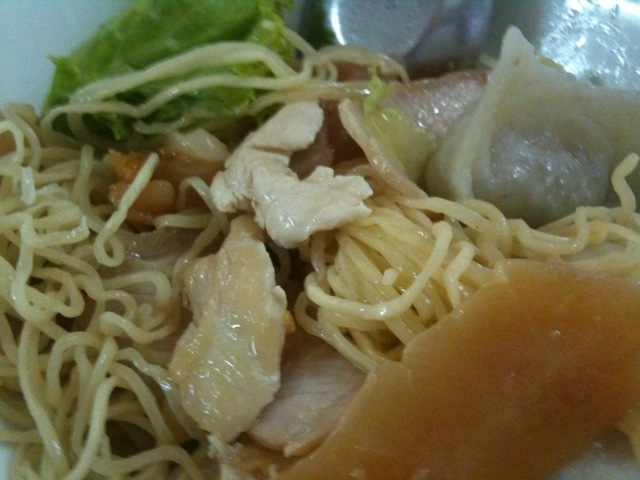 Italians use pasta for the wrapping…Thais use fish meat to wrap Kiaw pla !!! I agree with you. Fish dumplings are very unusual, and remind me of real Thai ingenuity. Dumpling-shaped meatballs! Taechew people modified the Kiew Pla (fish wan ton) c egg wheat noodles… Ba Mi Asawin was born in Siam… Foreigners would ask why??? I’m not sure everybody knows about the culinary contribution of Taechew people. Used your book last week while I had a guest in town and had a bit of feedback. What would be the best way to share it with you? Any questions or feedback, please email me at bangkokglutton@gmail.com and I will get back to you as soon as I can. Do you happen to have a Google Map of your suggested eats like Austin Bush? Austin has a Google Map too? Why that’s quite useful! I might someday, if I figure it out. I am extremely — how do you say this? — lo-tech. Will work on it and get back to you! Oh, yes. I fully expect to try all of the deliciousness described above if I’m in town in July. Congratulations on the book, the grueling workout, and B2S. Xoxo.